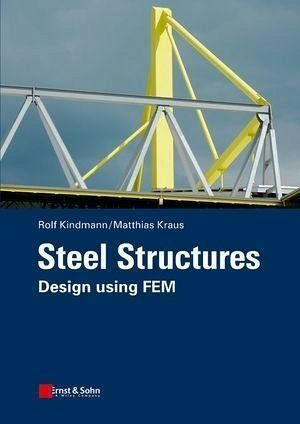 This book presents the design of steel structures using finite element methods (FEM) according to the current state of the art in Germany and the rest of Europe. After a short introduction on the basics of the design, this book illustrates the FEM with a focus on internal forces, displacements, critical loads and modal shapes. Next to finite element procedures for linear calculations considering the stress states of normal force, biaxial bending and warping torsion, non-linear calculations and the stability cases of flexural buckling, lateral torsional buckling and plate buckling are concentrated on significantly. In this context, design procedures for stability according to the standard Eurocode 3 is introduced and discussed. In addition, important fundamental issues are covered, such as the determination of cross-section properties as well as the elastic and plastic cross-section resistance. Complementary, finite element procedures for cross sections are dealt with, which will have an increasing importance in future. This book has evolved within the teaching activities of the authors in the lecture Computer-oriented Design of Steel Structures on the Master?s Program Computational Engineering at the University of Bochum. It covers the total variety of demands needed to be discussed for the safe, economic and modern design of steel structures.